A/P, lateral and oblique elbow films. Fracture is best visualized on lateral film. Nondisplaced: sling immobilization followed by gentle ROM initiated within 10 days. Consider initially long arm casting for 4 weeks or ORIF depending of patient and fracture severity. Initially weekly xrays indicated to ensure fracture remains reduced. Displaced Elderly/low-demand: ORIF vs excision with triceps advancement. 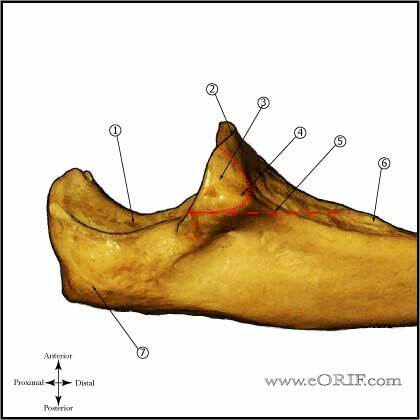 Olecranon Stress Fracture: generally associated with throwning sports, baseball. Treatment: rest and temporary splinting. Consider electrical stimulation. ORIF indicated after failure of nonoperative treatment. (Ahmad CS, Clin Sports Med 2004;23:665). 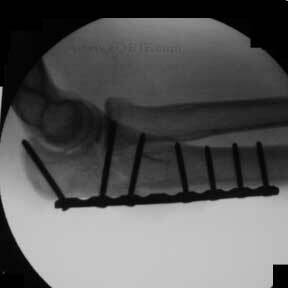 Painful hardware: occurs in 50%-80% of patients after olecranon fracture fixation. (tension band wiring frequently requires removal) (Karlsson MK, JSES 2002;11:377). Post-op: Place in posterior splint in 50-70º of flexion. Encourage finger ROM. 10-14 Days: Wound check, remove staples. Evaluate reduction on xrays. Place in long-arm cast or removable posterior splint depending on fracture type and strength of fixation. 6 Weeks: Wound check, evaluate xrays for callus formation. Place in removable posterior splint and begin elbow ROM exercises. 3 Months: Evaluate xrays for fracture union. Begin gentle sport specific exercises depending on fracture union. Consider bone stimulator if union not evident on xrays. 6 Months: Evaluate xrays. Return to sport. 1Yr: Evaluate xrays. Evaluate xrays using elbow outcome measures. May consider hardware removali f hardware is painful. Mortazavi SM, Asadollahi S, Tahririan MA. Functional outcome following treatment of transolecranon fracture-dislocation of the elbow. Injury. 2006 Mar;37(3):284-8. Ring D, Jupiter JB, Sanders RW, Mast J, Simpson NS. 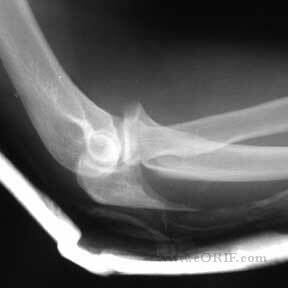 Transolecranon fracture-dislocation of the elbow. J Orthop Trauma. 1997 Nov;11(8):545-50.